Starting out at college can be an intimidating experience. Living in dorms, dealing with the rigors of college classes, climbing Freshman Hill every day — it is certainly a trying time for many. 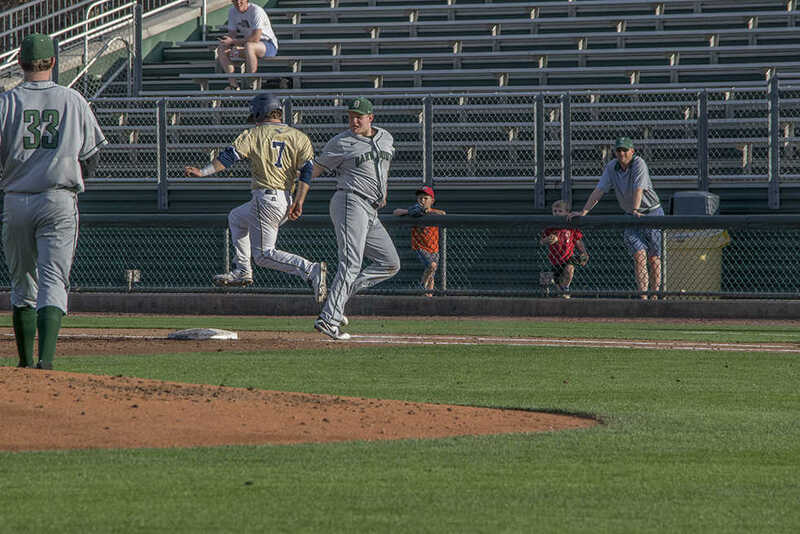 Add onto that the pressures of playing Division I baseball, and it might feel overwhelming, but for the youngest members of the Yellow Jackets’ baseball team, it is just another Tuesday. While most of Tech’s starting lineup and staff this year consists of upperclassmen, some of the biggest contributors to the Yellow Jackets thus far in this young baseball season have been the freshmen, making their presence felt during their first season in the ACC. The following are some of the biggest players making a name for themselves during their freshman season for the Jackets. Trevor Crapport was a rock at third base for the Jackets in his time at the Flats: Crapport started 111 games for Tech at 3B and slashed .302/.388/.469 from 2016-2017 for the Jackets. When he left via the MLB Draft last year, he left big shoes to fill — but freshman Luke Waddell has filled those shoes and then some, at least in the early stages. After what appeared to be an open competition for third base going into the season, Waddell has emerged on top, slashing .381/.458/.524 since taking over at the hot corner for the Jackets in eight games this season. Waddell’s three doubles tied for leading the team along with Chase Murray in this young season. It is a bit of a change for Waddell, who came to Tech as a highly touted shortstop prospect, but with Austin Wilhite already established as a defensive and offensive threat at shortstop, Waddell has excelled with the bat thus far while getting regular time in the starting lineup. It is especially unusual given his reputation for sure hands; in addition to being a nationally ranked shortstop prospect, Waddell was a standout running back at his high school. His freshman year of high school, Waddell racked up 1,593 rushing yards, 26 completions, 458 passing yards and 20 touchdowns en route to leading his team to a state championship, an incredible feat. Still, it is impossible to sit Waddell’s hot bat — one way or another, he is going to find his way into the lineup and he is going to produce. Tech is lucky to have Serratos in uniform this year. If things had gone a little bit differently, he might be playing pro-ball now — out of high school, Serratos was ranked by Perfect Game scouting as the No. 209 best prospect in the country, and was drafted in the 14th round by the Cleveland Indians. But Serratos delayed his professional debut for a couple years and came to Tech to play, and play he will, despite being blocked at his primary position, shortstop, by Austin Wilhite. Unlike Waddell, who snuck into the lineup by playing out of position, Serratos has found a way into the game as a relief pitcher. While having seen limited usage thus far, Serratos has been effective out of the pen — in 2.1 IP, he’s racked up two strikeouts, allowed two hits and given up zero earned runs. Perfect Game described Serratos as a having “a fast and loose arm [where] ball comes out of his hand clean and easy [and] 3/4’s arm slot.” Serratos’s fastball generally hangs around the low 90s, and his curveball gets impressive movement. It will be exciting to see Serratos when he gets reps at shortstop and some consistent at-bats, but for now, Jackets fans will have to be content to watch him develop on the mound, where he looks in his element already. In the Merriam-Webster dictionary, under “athlete” can be found Baron Radcliffe’s picture. Radcliffe is listed at 6’4” and 228 pounds on the athletics page, and almost all of it is muscle. Radcliffe poses an imposing figure on the field and was already drafted by an MLB team (picked in the No. 40 round by the Atlanta Braves, though he chose not to sign). Radcliffe comes to Tech as a celebrated two-sport athlete: in addition to setting school records for career HR and RBI at his high school, Radcliffe was a decorated quarterback, holding single-season records in rushing yards, passing yards and touchdowns for QBs, and was named to the Georgia All-State High School football team as a junior and senior. Radcliffe, despite being a freshman, has already found a spot in the lineup, principally manning right field for the Jackets. Despite struggling so far with the bat, hitting .211/.211/.316 in six games across 19 plate appearances, Radcliffe’s potential is far greater than his early struggles indicate. When Radcliffe figures out his struggles at the plate (“when”, not “if”), there is little doubt that he will be an impact player for the Jackets. Waddell, Serratos and Radcliffe are all immensely talented players who are already showing abilities beyond their years. As they continue to play at the collegiate level and hone their skills, they could serve as the core of a championship-contending team.